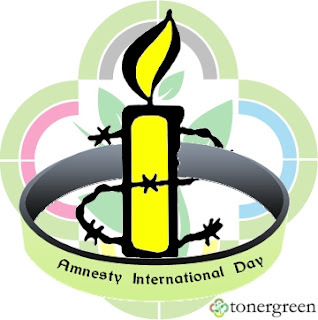 Amnesty International Day | TonerGreen - Eco-Friendly Toners from the U.S.
Amnesty International Day is celebrated every May 28th, its an important day to recognize the need to protect human rights around the world. It was started by the Amnesty International Organization commonly known as "Amnesty" or "AI", a non-governmental organization focused on human rights with objective "to conduct research and generate action to prevent and end grave abuses of human rights, and to demand justice for those whose rights have been violated." Amnesty International was founded in London in 1961 by British lawyer Peter Benenson when he launches a worldwide campaign, "Appeal for Amnesty 1961", with the publication of an article in the Observer newspaper titled "The Forgotten Prisoners". This article was written after Benenson learned about two Portuguese students from Coimbra who was sentenced to seven years in imprisonment for raising a toast to freedom. Benenson wrote, "Open your newspaper, any day of the week, and you will find a report from somewhere in the world of someone being imprisoned, tortured or executed because his opinions or religion are unacceptable to his government." Human rights are something we are born with. Every person has dignity and value. And that's what human rights is concerned about, equality and fairness.The right of every one to make choices about his or her own life and develop his or her own potential as a human being. It's about living a life free from any fear, harassment or discrimination. The rights to voice out his or her own opinions and express it freely. This is what Amnesty's crusade for, it draws attention to human rights abuses and campaigns for compliance with international laws and standards. It works to mobilize public opinion to put pressure on governments that let abuse take place. Every one of us are equal and human rights are something we should not be fighting for at the first place, because it is something we are innate with. Unfortunately, the world isn't exactly the same place as it used to be, discrimination, torture and harassment are everywhere, and we should start making actions to stop these. To put an end on these things that have caused enough grief and sorrow to its victims and the ones they love. So this Amnesty International Day, let's take our time to open our eyes about human rights issues and take part on the cause that Amnesty is fighting for justice and freedom. If you want to know more about Amnesty International Day and its history, you can look for Amnesty International Official Website or find articles through Google. And if you're going to print those as references, make sure you use remanufactured toner cartridges and ink cartridges for better printouts while helping the environment at the same time.